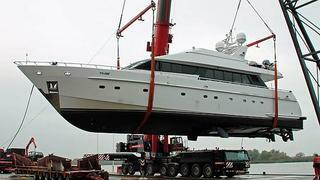 Moonen Shipyards in the Netherlands has been contracted to carry out a major refit of the 25.3m motor yacht Rusalina. Originally launched in 1992 as Xanadu, this classic example of a Moonen 83 will spend the next four months at the Moonen yard in Groot Ammers where a dedicated team of specialists will ensure that she is brought fully up-to-date in every respect. The refit will include a comprehensive exterior paint job, the laying of new teak decks, an extensive engine and generator overhaul, and the fitting of new stainless steel features such as anchor pockets and windscreen. The interior work will comprise system maintenance, the installation of new navigation & communication equipment and a range of cosmetic upgrades.